Unfortunately, your registration has been declined by the auctioneer. You can contact the auctioneer on +44 (0) 117 927 3888 for more information. You are the current highest bidder! To be sure to win, log in for the live auction broadcast on 08 Oct 2015 19:00 BST or increase your max bid. This well-travelled Shaun has been on an epic journey around Bristol's hospitals! From the Children's Hospital itself to the Dental Hospital, the Eye Hospital to the Audiology Department, he has visited children undergoing appointments and short-stay procedures, gathering a colourful hand or footprint from each! He even received a very special, tiny footprint from a baby in the Neonatal Intensive Care Unit at St. Michael's Hospital. 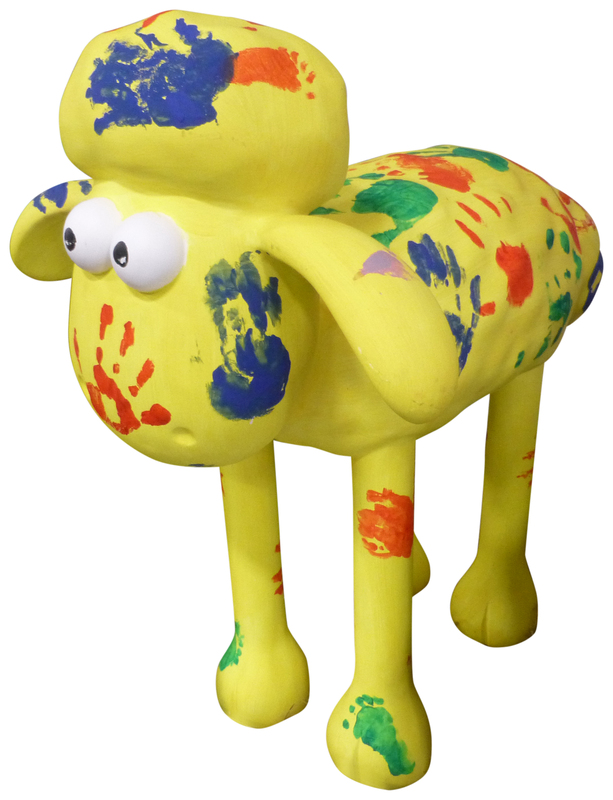 For Shaun in the City Auction delivery information please telephone +44 (0) 117 927 3888. On Thursday 8th October at The Mall at Cribbs Causeway in Bristol, all 120 Shaun in the City sculptures will go under the hammer in our grand art auction hosted by acclaimed Sotheby’s auctioneer Tim Wonnacott. Money raised from our 50 London sculptures will benefit Wallace & Gromit's children's Charity, to improve the lives of sick children in hospitals throughout the UK. Funds raised from our 70 Bristol sculptures will go to Wallace & Gromit's Grand Appeal, the Bristol Children’s Hospital Charity. A minimum deposit of 50% of the hammer price must be paid on the night. Full payment must be received within five working days of the auction. Please note that no auction items will be released until full payment has been received and cleared into our bank account. We are able to accept all debit and credit cards except American Express. Please note that 1.5% of the purchase price will be added for Credit Card payments and international debit cards payments. NOTE: Please advise your bank that you may be using your card for a one off payment and check your limit with your bank as each bank is different. Bank transfer via online banking. Faster Payments generally have an upper limit so please check with your bank in advance. Delivery around the UK can be arranged on request, information will be available in the Payment Room or for online bidders please email auction@shauninthecity.org.uk for more information and we will respond on Monday 12th October 2015. Buyers wishing to collect their sculptures, can do so but this will only be available from our secure site in North Bristol from Monday 12th October 2015 from 8am – 4pm through to Thursday 15th October 2015. No sculptures will be released on the night or prior to 8am on Monday 12th October. Sculptures not collected after this date or those for which delivery has not been arranged by 20th October 2015, a holding fee will be charged to buyers of £50 per day and will be payable prior to collection or delivery. The nature of the relationship between Wallace & Gromit’s Children’s Foundation (‘The Charity’ and ‘The Seller’) and Bidders and the terms on which the auction is held are set out below. Bidders’ attention is specifically drawn to Conditions 3/4 and 12/13, which require them to investigate lots prior to bidding and which contain specific limitations and exclusions of the legal liability of the Auctioneer and Seller. Clauses 12 and 13 detail the specific restrictions on the use of the Shaun in the City sculpture. Bidders, as prospective purchasers, should pay particular attention to these Conditions. (iii) (in connection with the lot) that negatively impacts on the reputation of the charity or which damages the reputation or goodwill associated with the lot or the charity or Aardman Animations Ltd.
(b) The Buyer shall indemnify (“The Charity”) against all liabilities, costs, expenses, damages and losses (including any direct losses, indirect losses, consequential losses, loss of profit, loss of reputation and all interest, penalties and legal and other professional costs and expenses) suffered or incurred by the charity arising out of or in connection with the use of the lot by the Buyer, a New Party or any third party or any breach by the Buyer of this clause 12. (a) The Buyer acknowledges and agrees that no intellectual property rights in the lot will pass to the Buyer as a result of the Buyer’s purchase of the lot. All intellectual property rights in the lot will remain with the charity or the charity’s licensors. (b) The Buyer acknowledges and agrees that no licences in respect of any intellectual property rights will be granted to the Buyer as a result of the Buyer’s purchase of the lot. (c) All goodwill associated with the lot (both at the time of the auction and afterwards) shall belong to the charity. The charity may at any time call on the Buyer to execute a confirmatory assignment of any goodwill associated with the lot and the Buyer shall execute it forthwith. Please see Conditions of Business for details. A standard Shaun in the City sculpture weighs approximately 80kg, but those with additions, embellishments and other effects can weigh considerably more. A small Shaun in the City sculpture weighs approximately 15kg. (a) A sale contract is made directly between Wallace & Gromit’s Children’s Foundation and the Buyer. In these Conditions of Business: “Shaun in the City” is the event that is owned and managed under licence from Aardman Animations Ltd by Wallace & Gromit’s Children’s Foundation. “Buyer” is the person that makes the highest bid or the winning bid accepted by the auctioneer. The buyer can bid in person or instruct an agent to do so on their behalf. “Buyer’s Expenses” are any costs or expenses due from the Buyer. “Purchase Price” is the Hammer Price. (a) Each lot offered for sale may or may not be available for inspection by Bidders prior to the sale. It is the responsibility of the Bidder to satisfy themselves as to both the condition of the lot and the accuracy of its description. (b) All lots are offered for sale in the condition they are in at the time of the auction on 8th October 2015. It is the bidder’s responsibility to inspect lots prior to purchase. This term applies whether or not bidders are in attendance at the auction. Illustrations included in printed material and on the internet are for identification purposes only and will not convey full information as to the actual condition of lots. (c) Information provided to Bidders in respect of any lot by the Charity, including any estimate, whether written or oral and including information in any catalogue, condition or other report, commentary or valuation, is not a representation of fact but rather is a statement of opinion genuinely held by the Charity. Any estimate may not be relied on as a prediction of the selling price or value of the lot and may be revised from time to time. (d) No representations or warranties are made by the Charity whether any lot is subject to copyright or whether the Buyer acquires copyright in any lot. (b) Without prejudice to Condition 4(b), any claim against the Charity or the Seller by a Bidder is limited to the Purchase Price with regard to that lot. Neither the Charity nor the Seller shall under any circumstances be liable for any consequential losses. (c) None of this Condition 4 shall exclude or limit the Charity liability in respect of any fraudulent misrepresentation made by the Charity or the Seller, or in respect of death or personal injury caused by the negligent acts or omissions of the Charity or the Seller. (a) The Charity have absolute discretion to refuse admission to the auction. Bidders act as principal unless they have the Charity’s prior written consent (via email is acceptable) to bid as agent for another party. Bidders are personally liable for their bid and are jointly and severally liable with their principal if bidding as agent. (b) The Charity advises Bidders to attend the auction if possible but will seek to carry out proxy bids that are in pound sterling and that in the Charity‘s opinion, are clear and received sufficiently in advance of the sale of the lot, endeavouring to ensure that the first received of identical written bids has priority. (a) Unless otherwise specified, all lots are offered subject to a Reserve, which shall be no higher than the low presale estimate at the time of the auction. (b) The auctioneer has discretion at any time to refuse any bid, withdraw any lot, re-offer a lot for sale (including after the fall of the hammer) if he believes there may be error or dispute, and take such other action as he reasonably thinks fit. (c) The auctioneer will commence and advance the bidding at levels and in increments he considers appropriate and is entitled to place a bid or series of bids on behalf of the Charity up to the Reserve on the lot, without indicating he is doing so and whether or not other bids are placed. (d) Subject to Condition 6(b), the contract between the Buyer and the Charity is concluded on the striking of the auctioneer’s hammer, whereupon the Buyer becomes liable to pay the Purchase Price. (e) Any post-auction sale of lots offered at auction shall incorporate these Conditions as if sold in the auction room. (a) Your obligation to pay the purchase price arises when the lot is knocked down to you on the fall of the Auctioneer’s hammer in respect of the Lot. (b) Unless agreed in writing with you by the Charity, you must pay all sums to the Charity in the currency in which the sale was conducted immediately upon winning the lot and you must ensure that the funds are cleared by the 5th working day after the sale. Payment must be made to the Charity by Bank Transfer, cash, credit card or debit card unless otherwise agreed with you in writing by the Charity. There will be a 1.5% charge for payment by credit and international debit cards, and no charge for UK debit cards. If you do not pay any sums due in accordance with this clause, the seller will have the rights to withhold the lot. (c) Title - in a purchased lot will not pass until the Charity has received the Purchase Price for that lot in cleared funds. The Charity are not obliged to release a lot to the Buyer until the title of the lot has passed. Any earlier release does not affect the passing of title or the Buyer’s unconditional obligation to pay the Purchase Price. (d) The purchaser is responsible for organising their own delivery/collection and lots must be collected or delivery arrangements organised by 4pm on Thursday 15th October. Please Note: Collection is only available from 8am until 4pm from Monday 12th October to Thursday 15th October 2015, thereafter they will be moved to another location ready for delivery or storage. The purchaser will be responsible for paying the daily storage cost of £50 per day from Friday 16th October 2015. The purchaser will be provided with details of where and how to collect their lot on receipt of full payment or delivery options available to them. Purchased lots are at the Buyer’s risk (and therefore their sole responsibility for insurance) from collection or from 16th October 2015, unless delivery arrangements have been organised with the charity. (6) To be paid interest on any monies due (after as well as before judgement or order) at the annual rate of 5% per annum above the base rate of Lloyds Bank from time to time to be calculated on a daily basis from the date upon which said monies become payable until the date of the actual payment. (10) (a) So long as such goods remain in the possession of the Charity, to rescind the contract for the sale of any other goods sold to you by the seller at the sale or at any other auction or by private treaty and apply any monies received from you in respect of such goods in part or full satisfaction of any amounts owed to the seller or to the Charity by you. (b) You agree to indemnify the Charity against all legal and other costs of enforcement, all losses and other expenses and costs (including any monies payable to the Charity in order to obtain the release of the lot) incurred by the seller (whether or not court proceedings will have to be issued) as a result of the Charity taking steps under this clause 8 on a full indemnity basis together with interest thereon (after as well as before judgement or order) at the rate specified in clause 8.a.6 from the date upon which the seller becomes liable to pay the same until payment by you. (c) On any re-sale of the lot under clause 8.a.2, the Seller will account to you in respect of any balance remaining from any monies received by him or on his behalf in respect of the lot, after the payment of all sums due to the Charity within 28 days of receipt of such monies by him or on his behalf. (a) The seller will not be liable for any injury, loss or damage caused by the lot after the fall of the Auctioneer’s hammer in respect of the lot. (b) The seller will not be liable (whether in negligence, other tort, breach of contract or statutory duty or in restitution or under the Misrepresentation Act 1967, or in any other way) for any lack of conformity with, or inaccuracy of the lot or any entry or estimate in relation to the lot. As the charity needs to retain and move the lots from the Auction site to the collection/delivery site during the dates 9th to 09:00 on the 12th October whilst the charity retains possession of the items auctioned, will ensure they are insured and securely and safely stored whilst awaiting collection/delivery. (a) All images and other materials produced for the auction are the copyright of the Charity, for use at the discretion of the Charity. (b) Should any provision of these Conditions of Business be held unenforceable for any reason, the remaining provisions shall remain in full force and effect. (c) These Conditions of Business are not assignable by any Buyer without the Charity’s prior written consent, but are binding on Buyers’ successors, assigns and representatives. No act, omission or delay by the Charity shall be deemed a waiver or release of any of its rights. (a) Governing Law - These Conditions of Business and all aspects of all matters, transactions or disputes to which they relate or apply shall be governed by and interpreted in accordance with English law. (b) Jurisdiction - For the benefit of the Charity, all Bidders and Sellers agree that the Courts of England are to have exclusive jurisdiction to settle all disputes arising in connection with all aspects of all matters or transactions to which these Conditions of Business relate or apply. (c) Service of Process - All Bidders and Sellers irrevocably consent to service of process or any other documents in connection with proceedings in any court by facsimile transmission, personal service, delivery by mail or in any other manner permitted by English law, the law of the place of service or the law of the jurisdiction where proceedings are instituted, at the last address of the Buyer or Seller known to the charity or any other usual address.